Dress up a delicious ziti recipe with sausage and spinach to make it a more complete meal. Lightly oil 13 x 9-inch glass baking dish. Combine pasta, spinach, mozzarella and 1/3 cup Parmesan cheese in large bowl. Stir in warm hot tomato mixture. 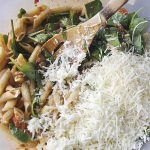 Baked Ziti with Sausage and Spinach was originally written by Leigh Anne Wilkes at https://www.yourhomebasedmom.com/baked-ziti-with-spinach-and-sausage/.